Your search for the perfect cuticle remover is finally over. Cuticle maintenance is a must to to keep your fingers looking tidy or to maintain your manicure. If you're tired of other products that just don't have sharp blades to do the job right, then Blue Orchids Cuticle nipper is for you! This is an ideal tool for cutting cuticles around your finger nails and toenails. No more spending hundreds of dollars on salon treatments. Extra Bonus: Enjoy the handy cuticle pusher & under nail cleaner with this cuticle trimmer. Sharp Blades: Sharp blades crafted for clean and even cuts. Sharp jaw clipper head makes a clean snip every time, without pulling or tugging. Half Jaw: This allows for easy maneuverability in small areas. 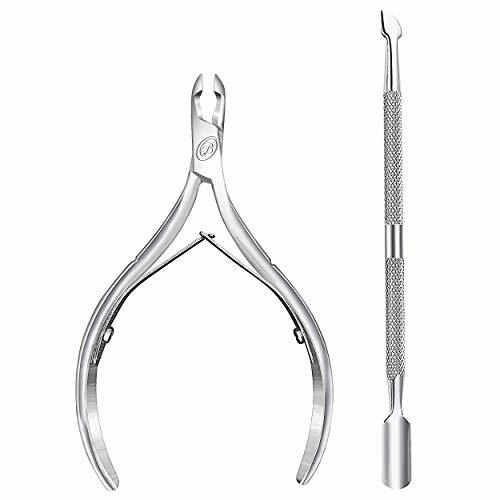 With this jaw size, you can remove those cuticles and dead skin even in or around small areas that cannot be reached by other nippers. Perfectly Aligned Blades: Blades are perfectly aligned to cut hangnails or overgrown cuticles cleanly and painlessly. Spring Action: Tapered spring-action handles allow for smooth, comfortable grip and easy cutting action. Your investment is well protected by Blue Orchid's lifetime guarantee! If you don't absolutely LOVE your Blue Orchids product, just return it, and we will refund you every penny. So "Add to cart" now. When you do, consider purchasing an extra one as a gift! Sold Exclusively By TAAJIR LLC. Blue Orchids Cuticle trimmer features surgical-quality, stainless steel tip. Its sharp blades cut even the tiniest cuticles with clean snip every time, without pulling or tugging. Use the bonus cuticle pusher to push cuticle before cutting. Blue Orchids Cuticle cutters offer great grip for cutting even in small areas around nails with jaw (6 mm to 7 mm). The handles are 4 long, which allows you to control and maneuver comfortably. Blue Orchids Cuticle remover is made from premium brushed stainless steel to retain sharpness for a very long period of time. You'll get the precision cut every time you use it! Blue Orchids Cuticle cutter is easy to clean! Simply wipe the blades with alcohol after use and slide the spring down for storage. This nipper is backed by lifetime Satisfaction guarantee or your money back when the product is purchased directly from us. Features: Package includes: 1 cuticle trimmer & 1 cuticle pusher an ideal tools set for cutting cuticles around your finger nails and toenails. No more spending hundreds of dollars on salon treatments. Sharp Blades: Sharp blades crafted for clean and even cuts. Sharp jaw clipper head makes a clean snip every time, without pulling or tugging. Half Jaw: This allows for easy maneuverability in small areas. 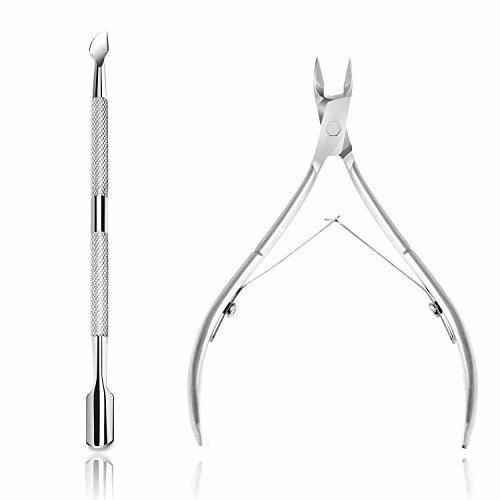 With this jaw size, you can remove those cuticles and dead skin even in or around small areas that cannot be reached by other nippers. Perfectly Aligned Blades: Blades are perfectly aligned to cut hangnails or overgrown cuticles cleanly and painlessly. Double Spring Action: Tapered double spring-action handles allow for smooth, comfortable grip and easy cutting action. Stainless Steel Built: This premium quality stainless steel built & rust free cuticle cutter is built to last and retain sharpness for a very long period of time. How to use cuticle pusher: Step 1: Soften the nails and cuticles by applying cuticle remover on the nail. Step 2: Submerge the fingers in a small bowl of warm water and soak them for about 3 minutes. Step 3: Use a small towel to gently dry your fingernails. Step 4: Use the rounded part of the cuticle pusher to push back the cuticles on the surface of the nail. 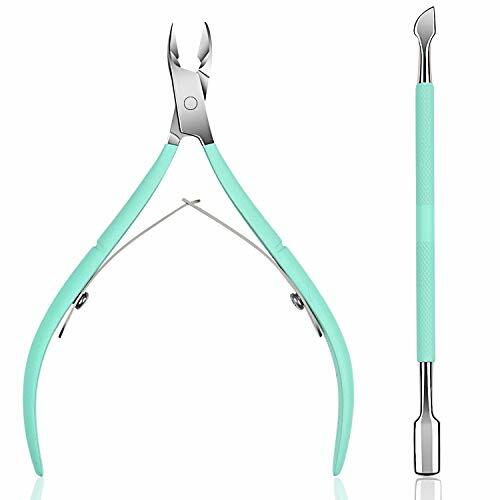 Effective Jaw Design Of the Cuticle Cutter Jaw head snipper isolates the problem area and snips away cleanly. Ideal for use at home, spas and salons. Sharp finished tips for precise cutting of hangnails and ragged cuticles. It is a great cosmetic tool for manicure and pedicure uses. Easy to Clean & Lifetime Satisfaction Guarantee These Cuticle Remover tools are easy to clean! Simply wipe the blades with alcohol after use and slide the spring down for storage.And they are 100% money back guaranteed;24 Hours Cutomer Service Online. Top Rated Cuticle maintenance Tool! Need to keep your hands looking tidy or maintain your manicure? If so, cuticle maintenance is a must. The two-sided dual action cuticle tool helps your hands looking salon-quality and well kept. The curved nail shaper offers customized shaping and easy cuticle pushing, while the smaller cleaning spoon tool removes dirt and build-up under the nail. 100% Stainless Steel material with rust and tarnish-resistant, as well as easy to sterilize. Keep this tool in your bathroom, travel kit, or purse for quick touch-ups and hassle-free manicure maintenance. Single tool includes 2-in-1 manicure maintenance heads. Customized shape for comfortable and painless use. Step 1: Soften the nails and cuticles by applying cuticle remover on the nails. Step 2: Submerge the fingers in a small bowl of warm water and soak them for about 3 minutes. Step 3: Use a small towel to gently dry your fingernails. Step 4: Use the rounded part of the cuticle pusher to push back the cuticles on the surface of the nail. Step 5: Use the pointed, sharp part to push down the cuticles at the corners of your nails. (You can also use this tip to clean under the nails. Repeat this process for all the nails). Step 1.Use professional nail remover to wrap your nail around 5 to 8 minutes. Step 2.Use the cuticle remover tool to soak off gel polish along the forefront of nail. Step 3.Perfectly remove the nail polish, then your nail surface will be smoothly as before. Top Rated Cuticle maintenance tool! Some of cuticle remover tools do damage to your nail , make your nail become rougher and thinner, even pain to use. 100% Stainless Steel PrettyDiva cuticle pusher is quite different from them, it has a excellent and creative triangle design , so relax and comfortable to get rid of gel polish without causing damage to sensitive skin, no traces on your nail surface, smoothly as ever. 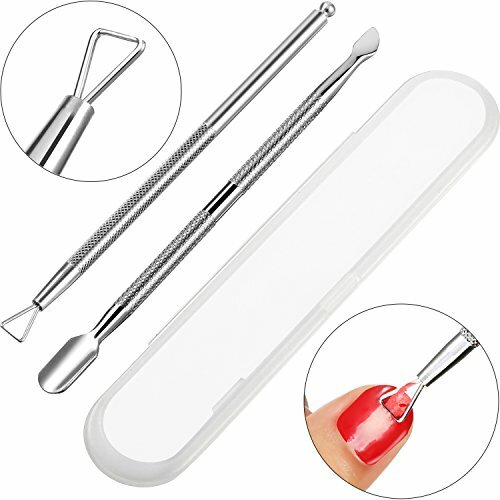 Brand new - Updated version of nail cuticle pusher and the newest nail polish scraper remove gel nail polish. Superior Materials - The cuticle scraper is made of high quality stainless steel and comes with a non-slip handle to use for 3 to 5 years. Zero Hurt - Never hurt your nails. In contrast to traditional cuticle pusher, it is easier and more comfortable to remove nail polish. It can get rid of the pain when using pusher to press and scrape away dead cuticle. Creative Design - Equipped with a creative triangle design based on the structure of the nails, the cuticle remover tool can be used to quickly get rid of dead cuticles without missing any small gap, even in your most vulnerable nail edge. Package include 1pc nail cuticle remover tool, easy to carry with your bag. 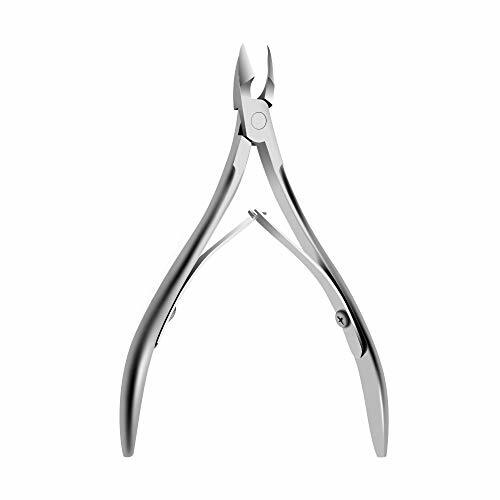 opove X7 cuticle nippers are maneuverable. Titanium space gray coating boosts this tool's high performance blades for snipping excess cuticles with cutting-edge precision and durability. opove X7 cuticle scissors are made with high quality surgical-grade stainless steel for long-lasting using. The sharp blades are finely hand-filed ultra-thin to perform with advanced accuracy. 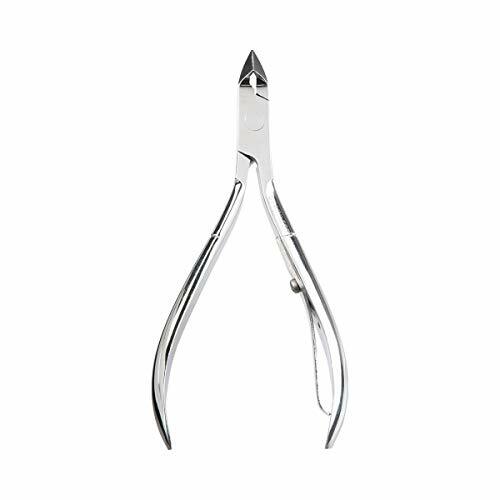 This cuticle nippers are specially designed with precision blades that can even cut the tiniest cuticles quickly & safely. The benefit from an ergonomics and easy to grip handle that give precise & accuracy cut, very easy to use. The stainless steel cuticle trimmer is coated in a Titanium finish - an incredible breakthrough technology for hard coating materials to improve their performance and rust resistance. The protective coating provides enhanced rust resistance and increases tool-life; also reduces friction, which contributes to durability and ease of use. Space gray finish is fashionable & on-trend. This is an elegant creation that's a prefect as a gift. Cuticle nippers comes with gift box. Lifetime replacement warranty for your purchase, simply contact us for a replacement if you have any unsatisfied. Top Rated Cuticle maintenance Tool! Need to keep your hands looking tidy or maintain your manicure? If so, cuticle maintenance is a must. This two-sided dual action cuticle tool helps keep your hands looking salon-quality and well kept. The curved nail shaper offers customized shaping and easy cuticle pushing, while the smaller cleaning spoon tool removes dirt and build-up under the nail. 100% Stainless Steel material is rust and tarnish-resistant, as well as easy to sterilize. Keep this tool in your bathroom, travel kit, or purse for quick touch-ups and hassle-free manicure maintenance. Step 1: Soften the nails and cuticles by applying cuticle remover on the nail. ECBASKET Cuticle Cutter & Cuticle Pusher *Updated quality polished stainless steel-Sharper & More Efficient *Precision Jaw Design *Unique Spring & Handle *Multiple Uses-Durable Manicure Pedicure Tools for Fingernails & Toenails *Easy Operation-Ideal for use at home, spas and salons. 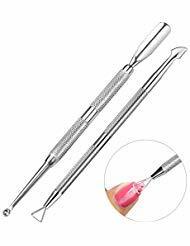 Premium Polished Stainless Steel ECBASKET Cuticle Trimmer and Cuticle Pusher are made of great polished surgical-quality stainless steel,so they can retain sharpness for a long time and promise you can get the precision cut every time. 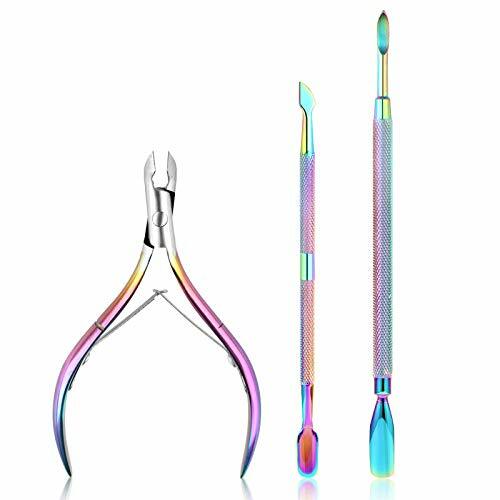 Chameleon Ergonomic Handle Design ECBASKET cuticle remover tools are easy to hold and use,which will give you a brand-new comfortable hand feeling and help you remover the cuticles more effectively.Chameleon design colorful nail art work. 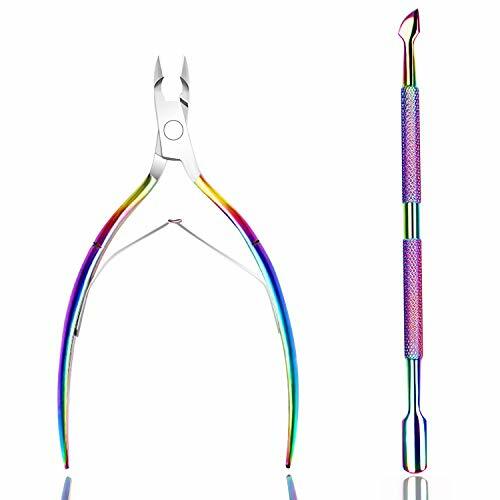 Perfect Jaw Design Of the Cuticle Nipper:ECBASKET cuticle nipper have a nice Jaw design which offers great grip for cutting cuticle off even in small areas around nails with clean snip every time.No pulling or tugging,perfect for manicure and pedicure uses at home, and salons. 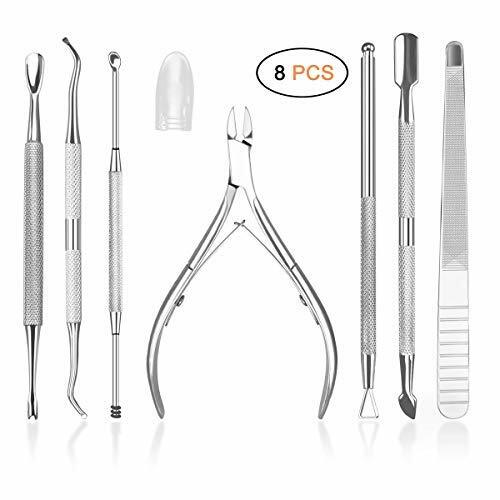 Dual End Cuticle Pusher:ECBASKET cuticle pusher are made of durable wear-resistant antirust material,curved flat end pushes the dead skin up clearly and sharp knifepoint shaped end cuts or scrapes dead cuticle away. Lifetime Quality Guarantee:ECBASKET Cuticle Remover tools are easy to clean,just wipe the blades with alcohol after use and slide the spring down,and put them in the attached PVC zip storage bag.And they are lifetime quality guarantee,any problem,just feel free to contact us. Flash Sale for a limited time!!! Double Spring Action: Tapered double spring-action handles allow for smooth, comfortable grip and easy cutting action. Your investment is well protected by Blue Orchid's lifetime guarantee, if you'd like your money back at any time, just ask. We'll refund you 100% - no questions asked! Just give it a shot! So "Add to cart" now. When you do, consider purchasing an extra one as a gift! Blue Orchids Brand is owned and distributed exclusively by TAAJIR LLC. Our products are backed by lifetime Satisfaction guarantee or your money back when the product is purchased directly from us. LIVINGO is both a brand name and a life attitude. It is both a fashion trend and a rich cultural heritage. It is not only the core of brand concept and individuality, but also a spiritual value orientation for consumers. Dedicated to providing global consumers with high-quality, high-precision household scissors products. The solid steel construction and a precise finely ground cutting edge make these shears the choice for the culinary artist. DURABLE RUST RESISTANT Sharp Stainless Steel: Forging press manufacturing process enables high-density steel that makes 3 times harder than the normal stainless steel and are smoother cutting. MULTI-PURPOSE--3.5 inch NOSE HAIR scissors for cutting nails, dry skin,eyebrow, eyelash, beard, even eyelid stickers. ROUND TIP design-safer protection especially for facial, nose hair grooming. MIRROR FINISH EASY CLEAN blades offer an higher class apparence that could also make them easy to be cleaned and stored. LIFETIME WARRANTY- Every Product is independently tested and selected to ensure the performance you expect, for everyday low price. The result is a quality item backed by our commitment to your satisfaction. Nail and cuticle maintenance is a must to keep your fingers looking tidy. If you're tired of other products that just don't have right precision to do the job right, then Blue Orchids Cuticle and nail care set is for you. Our nail gel polish remover and cuticle remover tools are perfect for professional nail art, nail art learner, salon, and home DIY nail art. Our cuticle remover will not do any damage to your nail, or make your nail rougher and thinner. Our manicure tools are simply fun to use. No more spending hundreds of dollars on salon treatments. Enjoy home manicure at the comfort of your home with BlueOrchids Cuticle and nail care tool set. Wrap your nail for 5 to 8 minutes with good quality nail polish softener to soak off gel polish. Refer to the 5th image for details. Hold the tool at a 30 to 45 degree angle and use the triangular head to scrape and remove nail polish form your nail bed. Wash your nail with Luke warm water. Apply cuticle softener enzyme on your cuticles to soften those. Use the cuticle pusher to push back the cuticles. Use the spoon head to scrape away dead cuticle and slowly remove form your nail bed. Use BlueOrchids cuticle trimmer nippers to cut the cuticles. Your investment is well protected by Blue Orchid's lifetime guarantee, if you'd like your money back at any time, just ask. We'll refund you. Just give it a shot! So "Add to cart" now. When you do, consider purchasing an extra one as a gift. FOUR IN ONE: Package includes 2 tools with 4 different ends - a triangular shaped nail polish scraper to remove gel nail polish with pointy end to clean underneath nails. And a cuticle pusher with spoon shaped cuticle cleaner on the other end. This is a must have nail supplies for nail design. SUPERB CRAFTSMANSHIP: Our cuticle care and nail polish remover tools are constructed from extra fine surgical-grade stainless steel. These are rust proof and retain precision for a very long period of time. Easy to hold metal grips ensures maximum nonslip control while working on cuticles and nails. These tools are polished without any sharp edge. Your nails won't be scratched while using our manicure tools. CUTICLE TOOL COMBO: The tool with cuticle pusher on one end and spoon shaped cuticle remover on the other end is the best cuticle care tool in the market. 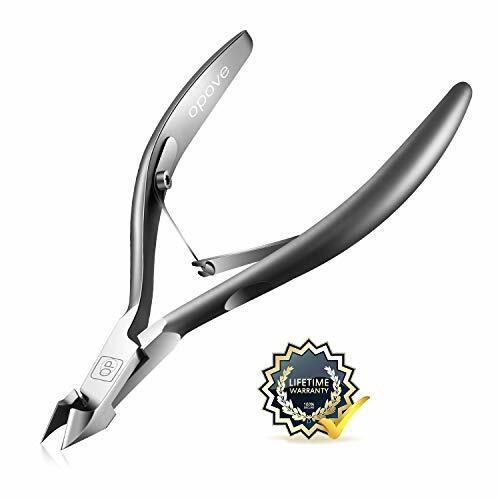 To make perfect, purchase BlueOrhids cuticle nipper for trimming. NAIL POLISH REMOVER: No need to use acetone nail polish remover. Our triangular nail polish peeler removes gel base and top coat from nail. It is sharpened to perfection to simply be the best gel nail polish remover in the market. The sharp corner of this manicure pedicure tool perfectly cleans the edges between nail and skin. It fits all nail sizes. BEST WARRANTY: Blue Orchids Brand is owned and distributed exclusively by TAAJIR LLC. Our products are backed by lifetime Satisfaction guarantee or your money back when purchase this product directly from us. Remember to remove all dust & glue with acetone after use. FBA delivery, 1-3 days can arrive you, fastest shipping, saving you time to get your package. 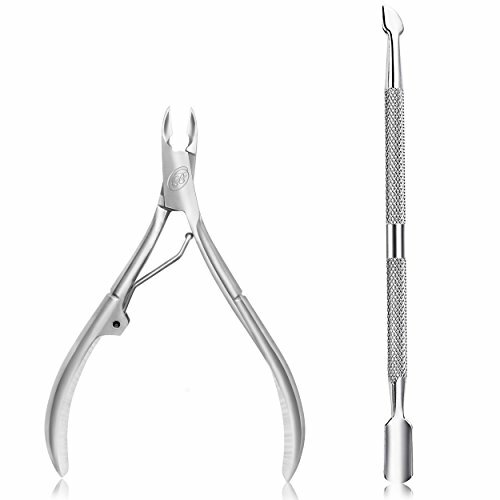 1.Package Content: 1x Nail cuticle nipper;2x Nail cuticle pusher,Excellent product. 3.Push back cuticle and trim dead skin around the nail and hang nail. 5.Suitable For Professional Salon Use Or Home Use.FBA delivery, fastest shipping, saving you time to get your package. hand skin will be soft, plump, smooth and moist. Therefore, it is very important to have a good hand tool. I Belive: Buy the set of Manicure tools, Have a pair of delicate hands. It's worth it. 3. When not using cuticle scissors, please cover the plastic cover. Professional Cosmetic Tools Including seven different beauty tools (Eyebrow Scissors, Slant Eyelash Tweezers, Curved Extra Fine Point Slim Tweezer, Cuticle Pusher and Cutter, Triangle Nail Polish Cuticle Remover, Acne Blackhead Comedone Lancet, Ear Pick, Cleaning Brush), This is a fully functional beauty tool, Complete care that covers your face and hands. Premium Material Tool HIFAU's 7 sets of cosmetic tools are made of surgical grade stainless steel with polishing finished, Process luster, comfortable texture, long service life. Which plays an important role in helping to better control the pressure during use, ensuring every step can be done accurately to avoid damage to the skin. Convenient Packaging We combine user needs, HIFAU's 7 sets of beauty tools, using artificial leather bag packaging, easy to carry, you can take it anywhere, suitable for travel or business trips. Perfect Gift For Your Beloved Give your beloved such a set of 7PCS hairdressing tools of full function, perhaps she will throw away old, your gift will become her belongings, this is a how happy thing. 100%SATISFACTION GUARANTEED We try to make the best product and satisfying after-sales service. If our products has any defects, you can contact us, and we will send you a brand-new product with the fastest speed. Features: Package includes: a handy cuticle pusher & a cuticle trimmer. Cuticle maintenance is a must to to keep your fingers looking tidy or to maintain your manicure. an ideal tools set for cutting cuticles around your finger nails and toenails. No more spending hundreds of dollars on salon treatments. Sharp Blades: Sharp blades crafted for clean and even cuts. Sharp jaw clipper head makes a clean snip every time, without pulling or tugging. Half Jaw: This allows for easy maneuverability in small areas. 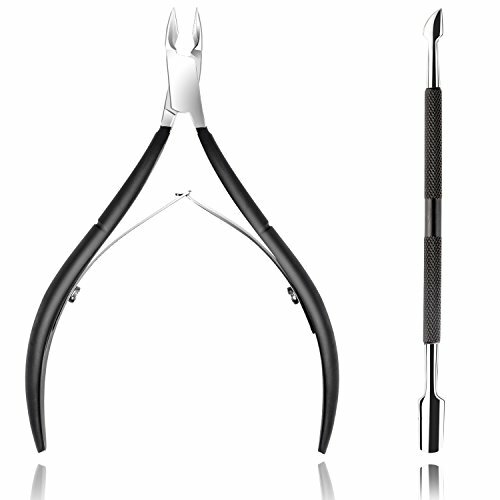 With this jaw size, you can remove those cuticles and dead skin even in or around small areas that cannot be reached by other nippers. Perfectly Aligned Blades: Blades are perfectly aligned to cut hangnails or overgrown cuticles cleanly and painlessly. Double Spring Action: Tapered double spring-action handles allow for smooth, comfortable grip and easy cutting action. Stainless Steel Built: This premium quality stainless steel built & rust free cuticle cutter is built to last and retain sharpness for a very long period of time. How to use cuticle pusher: Step 1: Soften the nails and cuticles by applying cuticle remover on the nail. Step 2: Submerge the fingers in a small bowl of warm water and soak them for about 3 minutes. Step 3: Use a small towel to gently dry your fingernails. Step 4: Use the rounded part of the cuticle pusher to push back the cuticles on the surface of the nail. Step 5: Use the pointed, sharp part to push down the cuticles at the corners of your nails. (You can also use this tip to clean under the nails. Repeat this process for all the nails). Triangle head design, it does not hurt your nails, and easy and comfortable to remover nail polish, suitable for various size and shape of the nails. The curved-end is use for pushing cuticles, the design easily helps to shape the cuticles; The other end helps to cut or scrape away dead cuticle. Made of good quality stainless steel, anti-rust and durable to use; The nail polish remover tools all with a textured no-slip grip, you can control the handle well while using, not easy to fall off. This manicure pedicure tool kit is good for profession nail art, nail art learner, salon, and home DIY nail art; They are packed in a plastic box, very convenient to store, keep the beauty tools dry and clean. 1. Use soak off nail foils to wrap your nail around 5 to 8 minutes. 2. Remove the nail foils; Use the manicure tool, and remove the softened nail polish. 3. Apply nutritious oil to nursing or reapply nail polish. Please use the cuticle pusher tool softly and gently. Soak off nail foils are not included. Package:10 piece set of plastic cuticle pushers. Dual sided tips make this a great reusable multitasker. A hard rubber tip on one side to push back your cuticles and then a pointed, hard plastic tip to clean/scrap under your nails or around your cuticle edge. The handle has a beveled shape to make holding this tool more comfortable with less hand cramps. Size: 3.8 in. (L) x 0.25 in. 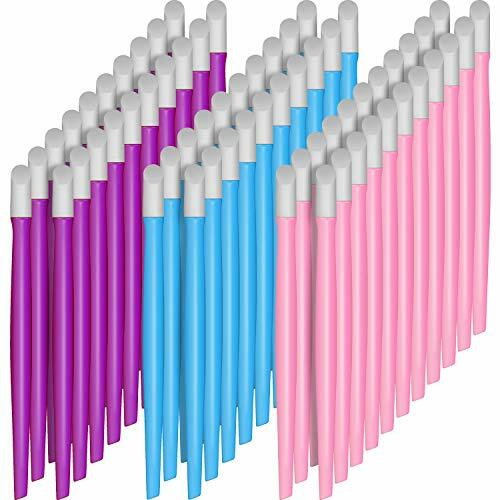 (W) Random color (pink, blue, purple) Package includes 10pcs rubber cuticle pusher. Material: Nail cuticle pusher are made of high quality Acrylic, can be used for a long time. Ergonomic beveled handle makes manicure work pain-free. Dual tipped for cuticle pushing and cleaning: Great for pushing back the cuticles and cleaning under the nail. It is more comfortable to remove dead cuticle without miss any small corner, even in your most vulnerable nail edge. Warm Tip: When your hands are damp and cuticles are soft, cuticle pushing and cleaning is much easier and painless. QUALITY GUARANTEED: 30-day Products Exchange and Money Back Guarantee. If you have any other questions, please feel free to contact us! The cuticle trimmer makes cutting the dead skin around your nails cuticles without tugging or tearing. Quality stainless steel is rust-proof and easy to clean. The nail cuticle trimmer can hold on tightly when you scrape away dead cuticle, not easy to slip and don't hurt your nail. This pusher under-nail scraper has a nicely rounded edge to ensure you don't puncture the delicate skin under your nail. 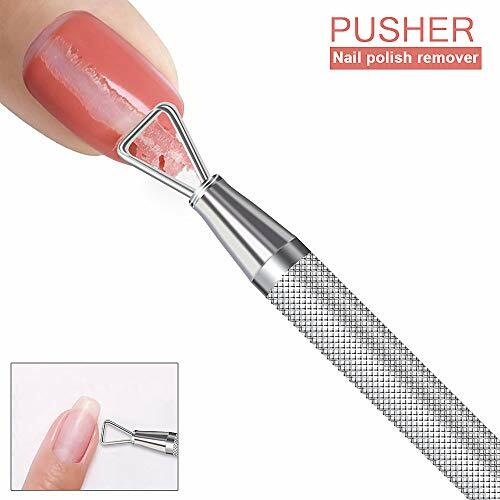 It is easier and more comfortable to remover nail polish, it is easy when using pusher to press and scrape away dead cuticle. HIGH-GRADE CONSTRUCTION. Boasting German-grade quality, this Titania Soft Touch Cuticle Knife is expertly constructed with Solingen steel and an acrylic resin handle to provide long-lasting durability and continual use throughout the years. DOUBLE INSTRUMENT. Gently push back and trim your cuticles. This Double Instrument features a cuticle pusher on one side and an integrated cuticle knife on the other, so you can maintain healthy hands at all times. RELIEVES PAIN. Dry, torn cuticles and hangnails can get caught on your clothing, resulting in painful swelling, bleeding and possible infections. Carefully removing them with the right tool will prevent that from happening. PRECISE CUTTING. Tough, dried-out skin can become a challenge to cut. Furnished with an extra-sharp, v-shaped blade, this knife is specially designed for precisely and safely removing unwanted cuticles or painful hangnails. ERGONOMIC DESIGN. The non-slip grip and ergonomic shape enable easy and thorough removal of the cuticle - even in hard-to-reach areas - while the soft rubber hat allows you to easily push back and cut your cuticles. High Grade Stainless Steel Makes it Sharper & More Efficient Ejiubas Cuticle Remover tools are made of 100% Surgical-quality stainless steel to assures a long lasting cutting edge and can be sterilized without rusting,and it keeps the precision cut every time you use it. Ergonomic Skidproof Green Baking Varnish Handle Design & Protective Cap Packaging includes a plastic protective cap to guard against accidental stabs or pokes and in addition comes with transparent travelling pouch that provides the best protection to keep the instruments secured,guaranteeing their life span. 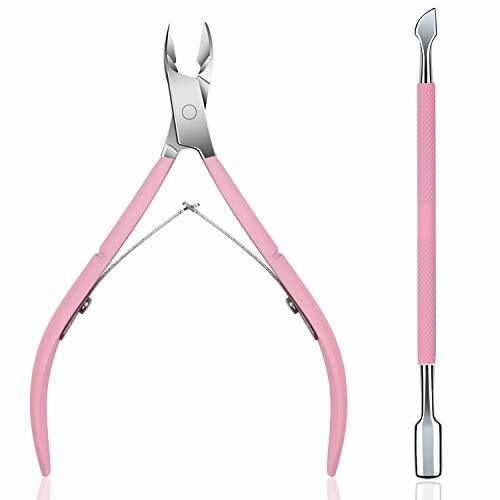 Effective Jaw Design Of the Cuticle Cutter Jaw head snipper isolates the problem area and snips away cleanly.Ideal for use at home, spas and salons. Sharp finished tips for precise cutting of hangnails and ragged cuticles.It is a great cosmetic tool for manicure and pedicure uses. Dual End Nail Pusher & Perfect for Cuticle Removal Sharp to cut or scrape away dead cuticle on one end,Curved flat end perfectly pushes the skin back flawlessly,Durable metal resists wear and tarnish. Easy to Clean & Lifetime Satisfaction Guarantee These Cuticle Remover tools are easy to clean!Simply wipe the blades with alcohol after use and slide the spring down for storage.For what reason you don't satisfied this item,please feel free to contact us,100% money refund,No questions asked and no hassles. 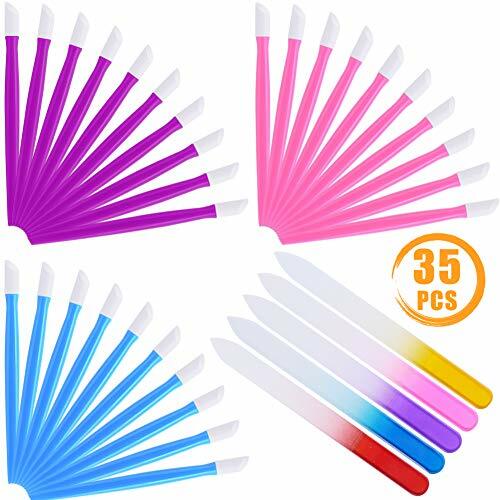 Colored nail art tools in 3 different colors, including blue, purple and pink color, each color accounts for 20 pieces, the rubber head is white color, which match well and look good together. Dual tipped design work well for you to push and clean cuticle, and the handle provide convenience and comfort for you to hold, make nail cleaning work easier, suitable for both men and women to use to clean the nail and remove dead cuticle. Kids should use it under adult's supervision. Ergonomic Skidproof Pink Baking Varnish Handle Design & Protective Cap Packaging includes a plastic protective cap to guard against accidental stabs or pokes and in addition comes with transparent travelling pouch that provides the best protection to keep the instruments secured,guaranteeing their life span. 1. Compared with metal head, rubber head is softer to use when push and clean cuticle. 2. Plastic handle is more comfortable to hold than metal handle. 3. Made of hard rubber top and plastic handle which is durable for long-time use. 4. Do not contain any metal, so can be applied in bathroom. 5. Used to push and clean cuticle, press nail stickers after you stick on your nails. 6. Quantity is enough for your daily use and sharing with others. 7. Suitable for home and nail shop use. 8. Come with 3 different color handles (blue,pink,purple), for your different use. More comfortable: compared with metal head, rubber head is softer to use when push and clean cuticle; plastic handle is more comfortable to hold than metal handle. Our nail cuticle pusher can make nail cleaning work easier. Material: made of hard rubber top and plastic handle which is durable for long-time use. Because our nail cuticle pusher do not contain any metal, so it can be applied in bathroom. Application: push and clean cuticle, press nail stickers after you stick on your nails. 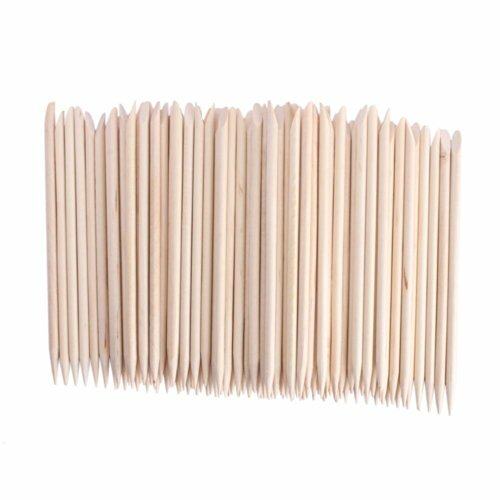 Abundant quantity: come with 60 pieces rubber nail cuticle pushers in one package, which is enough for your daily use, replacement and sharing with others. Suitable for home and nail shop use. 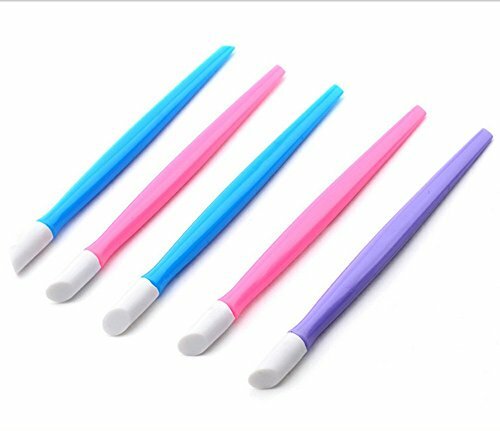 3 different colors: come with 3 different color handles (blue,pink,purple), for your different use so that won't mix together. The blades are even and aligned.The clippers are durable, precise ,and easy to use. The tension bar that opens the nipper has good tension and clicks satisfyingly and securely into its notch. 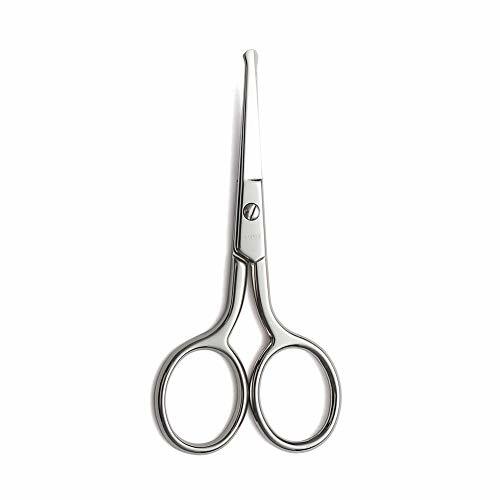 These stainless steel high performance blades make snipping excess cuticles easy and precise. Glamorous yet sturdy design is reinforced by rock-hard, stainless steel construction for frequent use. The ergonomic shape isolates problem areas and nips for a clean look and feel. Great for home, waterless manicures, pedicures or take it to the nail salon. When used, you will found they are really sharp and get so close to the area you want to cut that you are left with a really smooth finish to your cuticle. Also easy-to-use beauty tools, even for beginners, to better understand what is beauty and enjoy the change. 1.Remove the dead skin on the nails and beautify the edges of the nails, which is more conducive to nail polish; Remove the burrs on the edges of the nails, remove the burrs that are not harmonious at the corners, and reduce the friction between the fingers; Remove barbs, Neat, no pain and health. 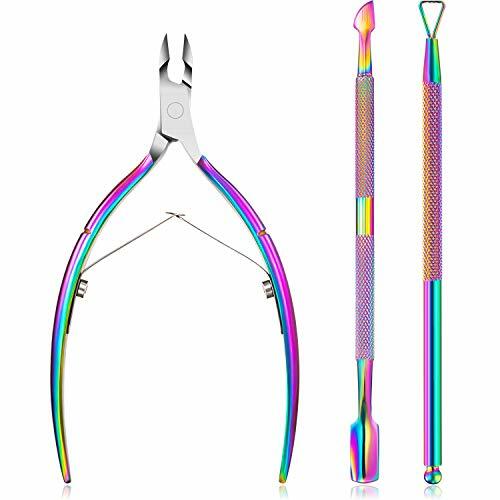 2.Professional 1/2 jaw cuticle cutter was handmade, perfect for salons.And Rockhard construction is sturdy and long lasting. 3.Cuticle trimmer features surgical-quality, stainless steel tip. Its sharp blades cut even the tiniest cuticles with clean snip every time, without pulling or tugging. Use the bonus cuticle pusher to push cuticle before cutting. 4.Cuticle cutter is easy to clean! Simply wipe the blades with alcohol after use and slide the spring down for storage. 5.This nipper is backed by lifetime Satisfaction guarantee or your money back when the product is purchased directly from us. 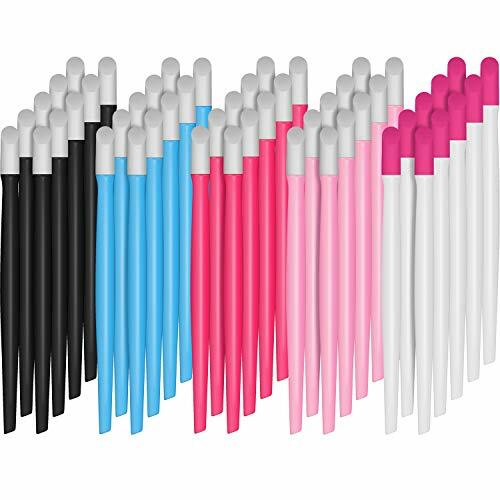 Multiple bright colors for you to choose, the specific information you can see from the picture, they look good, portable and can be carried easily. Dual tipped design is practical for you to push and clean cuticle, with handle, can provide convenience and comfort for you to hold, make nail cleaning work easier, suitable for both men and women to use to clean the nail and remove dead cuticle. 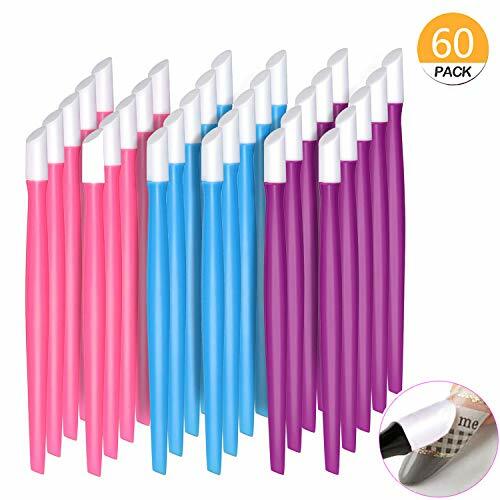 Exfoliating rods use good materials, do not break easily, have a long service life and are "widely used"
Exfoliating sticks and nail files can be used to clean your nails. The set is easy to use. It can fit for clean your nails. It can also be used for nail art. Give this to a friend who likes nails, she will be very happy to receive this gift. HIGH-GRADE CONSTRUCTION. Rustproof and easy to clean, this Cuticle Nipper is expertly constructed of German-grade quality stainless steel to provide long-lasting durability and continual use for years to come. RELIEVES PAIN. Dry, torn cuticles can get caught on your clothing, resulting in painful swelling, bleeding and possible infections. Carefully trimming them with the right tool will prevent that from happening. PRECISE CUTTING. Tough, dried-out skin can become a challenge to cut. Furnished with extra-sharp, cutting edges, these nippers are specially designed for precisely and safely cutting cuticles for healthy hands and feet. TIDY APPEARANCE. Cleaned, trimmed cuticles are a reflection of good hygiene. Made to the highest quality standards, these nippers trim dry, hardened skin with meticulous accuracy, allowing you to maintain a well-groomed appearance. EASY TO USE. Soak fingers or toes in warm, soapy water to soften your skin for about 5-10 minutes. Gently push cuticle back, then carefully trim rough skin using the cuticle nipper.